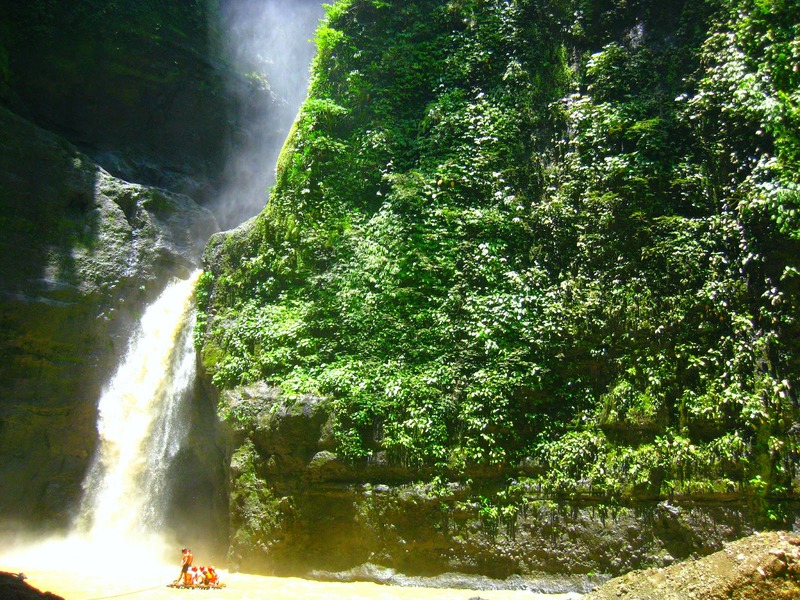 The group was extremely excited when I told them that I included Pagsanjan Falls in the itinerary - a plan that I was forced had to put together within 2 hours. From Villa Sylvia Resort, we hopped from one jeep to another until we reached Pagsanjan Aresi Complex. Asking for directions initially from the locals was a breeze but finding our way to Pueblo El Salvador (the jump off point) proved to be a challenge since all the locals we asked knew only of the usual Php1,250 route, doesn't know where Pueblo El Salvador is or what it is. 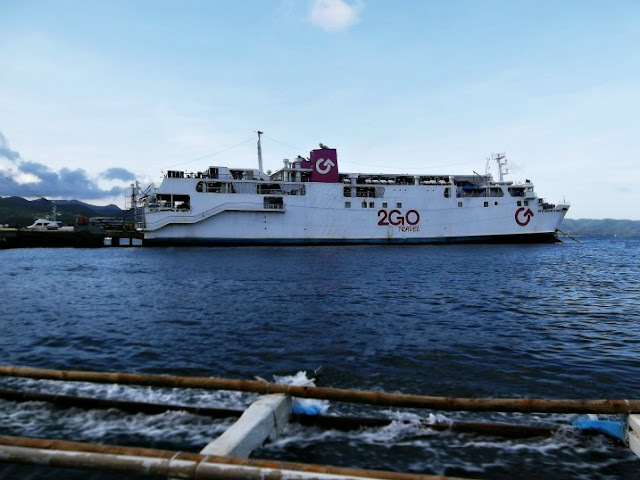 We probably asked the wrong people, those men at the terminal at the back of Jollibee - Pagsanjan Aresi Complex offering a staggering boat tour doesn't help either. Don't stop and deal with illegal boatmen flaggers running along the road! Inquire at the tourist information center. In case of harassment/overpricing and force tipping, call tourist police force (049) 501-4054 or 821-0166. Fortunately, just when we started looking for an internet shop, a guy from a celphone store, few feet from Jollibee pointed us to a nearby tourism office - just the perfect help we need! At last, questions were answered with honest to goodness service from Mr. Ramon Cabela of the Tourist Information Center (0999-7445561). He was cool, friendly and very accommodating. He even called Pueblo El Salvador informing that we're heading right there and told us we just needed to pay Php150 for the entrance fee, guide and the raft ride! 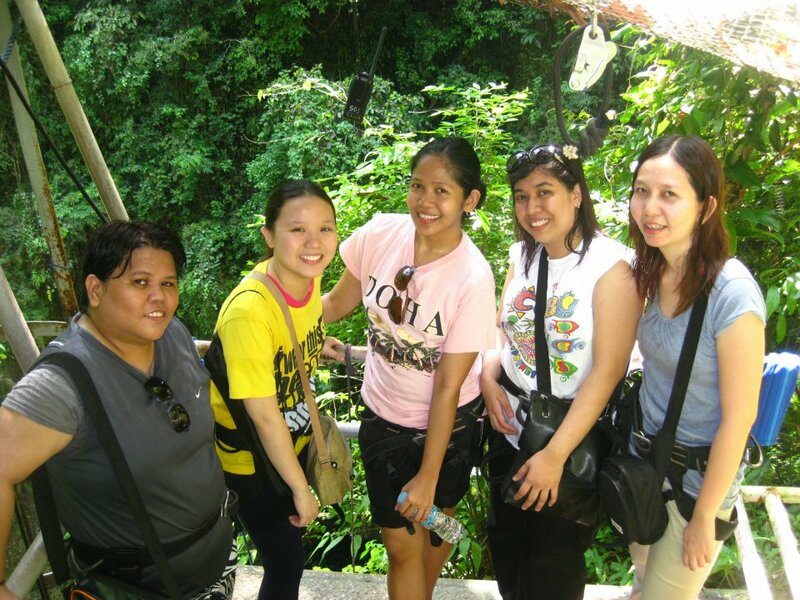 We wasted no time and hailed a jeepney bound to Lucban and dropped off at Cavinti. We hired a tricycle driver and found ourselves on an uphill ride then paid him Php20 each. We asked his phone number so we can just text him to fetch us once we're done with the trek. 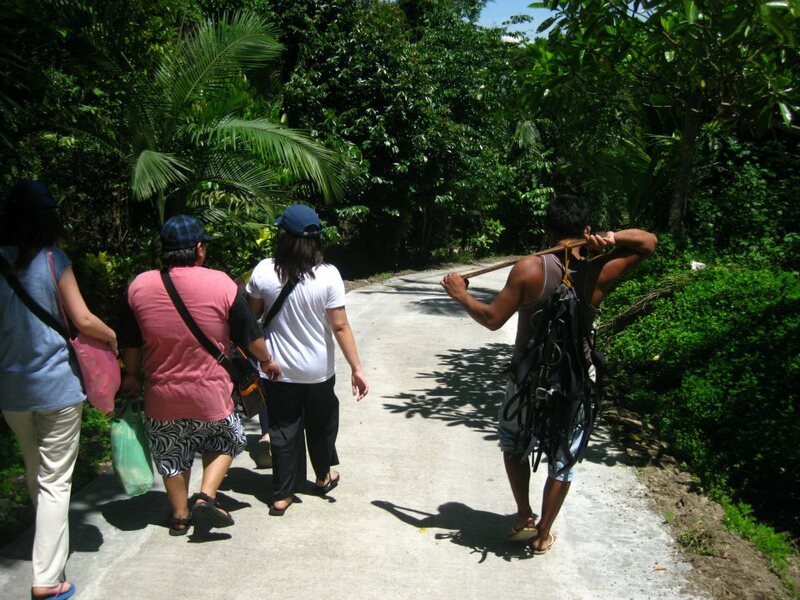 Kuya Newton, our first guide, was also game to take snapshots of us during the first part of the easy trek. When we reached an area with the Lord's statue, he began putting our harness one by one. 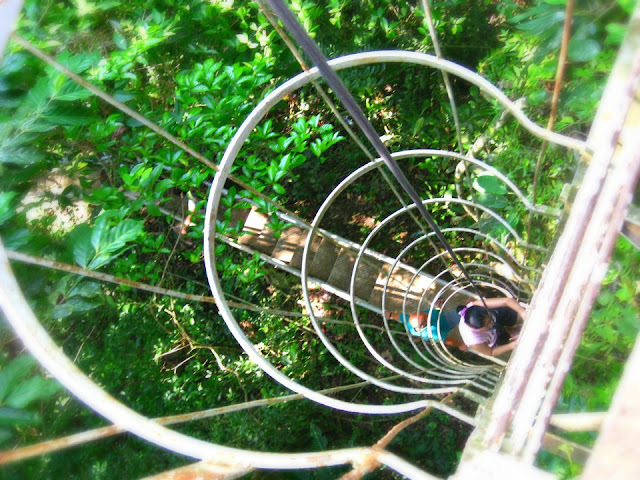 This is the start of our vertical descent! I was first to descend. Tapang-tapangan lang. Unlike the usual rappelling where you have to make leaps after another (which takes some skills and more guts), the one in Pagsanjan is an easy way down, all you need to do is hold on to your rope with both hands, try to get your feet together for a safer way down and let the guides do the hard work (look at Macy's picture on the left). Here's a video of my friend Ghia as she holds on to her dear life, lol! 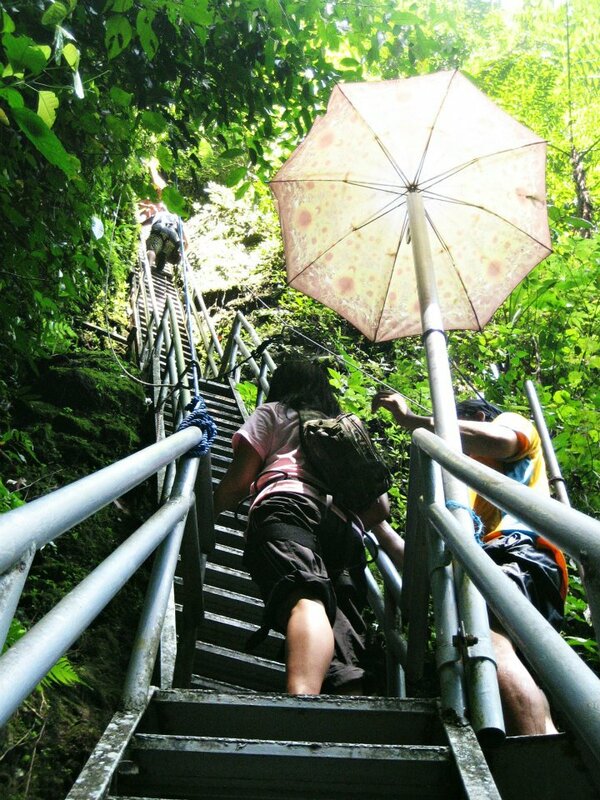 The trek may be a challenge and the guide won't be with you all throughout, but even beginners can try hiking the trail because there are metal railings for hikers to hold on to. 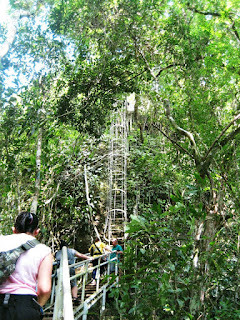 The rappelling part was surely an added adventure - you get to experience it twice before you reach the falls. 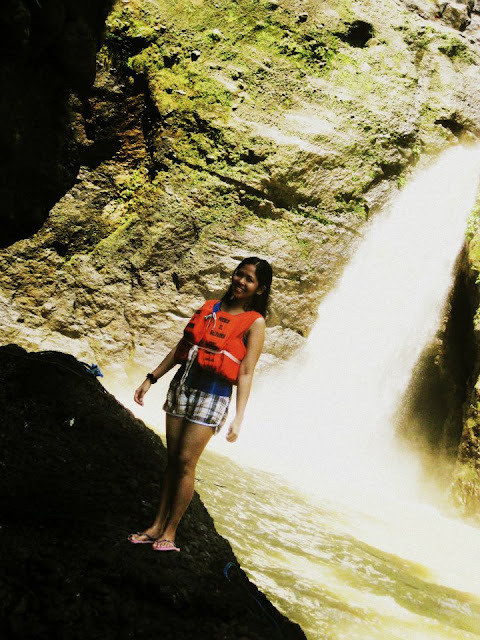 Plus you get to see some other falls too aside from Pagsanjan Falls. The falls wasn't looking at its best when we went there due to previous strong rains which makes the water look brownish. This international destination famous for Francis Ford Coppola's "Apocalypse Now" is probably the most visited waterfalls in the country. Summer has just officially ended yet foreign tourist still flock the area, mostly Koreans. Armed with life vests, we left our things including our cameras in a nearby kubo and asked another guide to take some video and pictures of us getting near the falls. How we all wished we have an underwater camera. Ang saya talaga lalo na sa ilalim ng falls - the exhilarating rush of water and the thunderous sound makes the experience worth sharing with your kalog and makukulit friends! 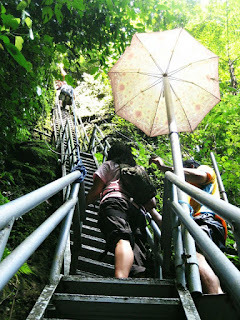 Sinulit na namin ang Php150, we stayed inside the cave for 30 minutes I guess. Nothing much to see in the cave, we just savored the cool splashes coming from the falls and dip our tired feet as tourists come and go. May time na kami lang talaga ang mga tao sa loob and still we're having fun sharing stories and our aspirations of visiting other more places. After getting enough chills, we left the cave along with a foreign family who tagged along their cute little son who's obviously enjoying the water. We ate our baon, snacking at 1pm, surprisingly we weren't that hungry for lunch - a few packed cupcakes sufficed. 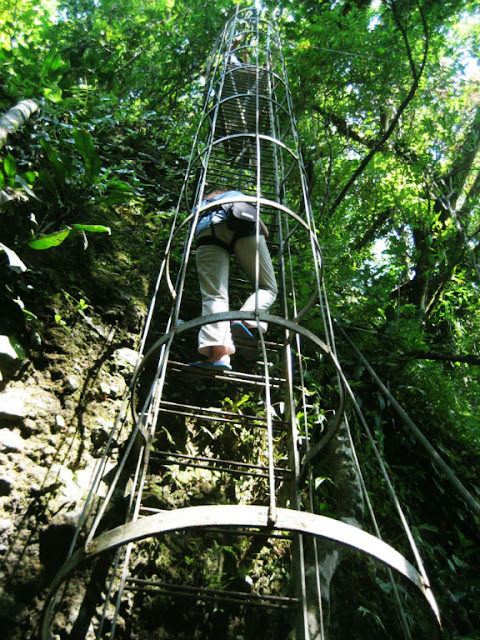 Getting ready for another climb, the trek up proved to be more challenging and literally more breath-taking. Felt like I lose a pound or two in just one day. 2. Keep your belongings to a minimum. If you'll be coming from a resort nearby, just bring the basics so it's easier to hike. 3. Rest if you must. If you're someone who's not in perfect shape to hike for hours, don't be afraid to tell your companions to slow down. Who's in a hurry anyway. Enjoy the beautiful forest views. 4. Be mindful of your trash. 5. Wear something light and comfy. 6. If you're wearing contact lenses, I advise that you wear goggles to fully enjoy the raft ride. 7. Since the hike on return back suggests that you put on your best spiderman move, it helps to do some stretching before the trek. 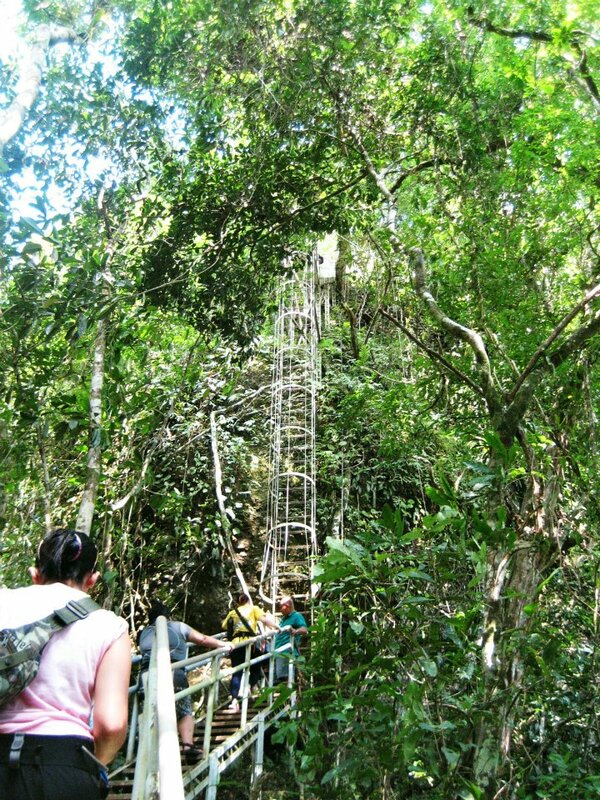 It's the cheapest package offered by Pueblo El Salvador in Cavinti. Sulit na sulit! 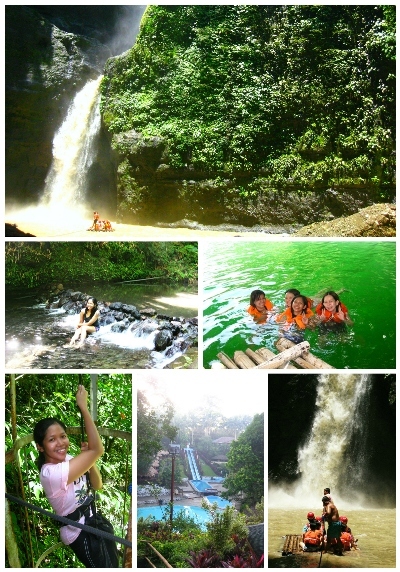 I've always wanted to see Pagsanjan Falls. Thank you for sharing your tips. pwede kaya 3 yrs old sa rappelling?isabay nlang ng adult? I don't think it's advisable dexter. Mahirap ang paakyat. Wag na lang kayong magsama ng bata to be safe. Hi. I like your post. Maganda pa ba ang Pagsanjan Falls? Di ba nakakahiya to show to foreign visitors? hello, may contact numbers ba na pwede namin hingin? Hi, I'm in a group of backpackers visiting the Philippines and would love to try this out... How do I get this 150php deal? Sounds amazing!! Hi Lei, hiwalay yung fee sa shooting the rapids, mas pricey yun since effort sa mga bangkero. Ito pinili namin, yung cheaper route, at kami ang nag-effort sa pagtrek pababa. Kakaibang experience! 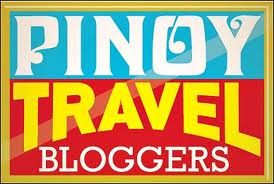 Hello mam Sarah..Thank you very much for this blog about Pagsanjan Falls.Gusto ko lang po itanong kung hindi naman po ba mananakaw ang valuables mo gaya ng DSLR kung sakaling iiwan ko po ito sa 'kubo' na binanggit nyo po dito?Thanks po in advance sa reply. To be honest, kung DSLR ang dala ko nun, I would be more extra careful with my things. Nung time namin pinabantayan lang kasi namin mga bags sa mga kuya na nandun. Sila din naman kasi ang kasama naming magttrek pabalik. pag kano po yung expenses pag pumunta dito PHP 150 lang po ba talga .. ? paano po kayo matawagan for information pa? Hi! Ill be coming from Cavite and will take public transportation. Kung dalawa lang kami, 150 pa rin kaya yung bayad? And matao ba? Parang mas adventurous kasi kung ganito yung gagawin kesa magbook ng package tour. Mas cheap pa!